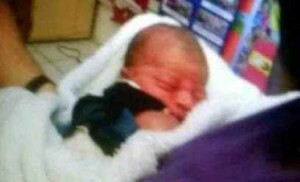 Home » Who leaves a Newborn Under a Tree? In another shocking case of infant abandonment, a woman picking up her child from a day care centre in South Florida was surprised to find a newborn under a tree in Pompano Beach. The baby boy is thought to be between one and three days old. He was discovered lying on a patch of dirt between a parking lot and a three foot hedge at NE 2nd street and NE 2nd Avenue. When the women found the baby, he was wrapped in a blanket, but his umbilical cord was still attached. According to news reports, the lady was out to pick her child from day care Thursday afternoon when she found the baby under the tree. She flagged down day care bus driver Jaceline Saxton and called 911. The fire rescue crew came to the baby’s rescue immediately and took him to the Holy Cross Hospital. Thankfully the tiny baby is said to be in good condition at the hospital. Florida’s Safe Haven law states that parents can drop off babies up to 7 days old at a fire station or hospital with no questions asked. Officials are now searching for the parents as leaving a baby elsewhere becomes a criminal charge. The baby will be turned to a state licensed adoption agency, where he will hopefully be adopted into a loving family.